Our staff at Vinson Dental is committed to bringing you the best dental experience every time you visit us. Take a look at our dentist, dental assistants and dental hygienists to learn more about our practice! Dr. Brian Vinson is originally from Goldsboro, North Carolina. He completed his Bachelor’s Degree in Mathematics at the University of North Carolina at Chapel Hill in 1998. 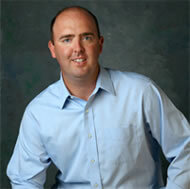 In 2004, he graduated from the University of Louisville’s School of Dentistry. Dr. Vinson’s Advanced Education in General Dentistry Residency was completed at the UNC Chapel Hill School of Dentistry in 2005. After completing his residency, Dr. Vinson worked for two different private practices before deciding to open his own practice in Winterville, N.C. Dr. Vinson is a member of the American Dental Association, N.C. Dental Society, Winterville Chamber of Commerce and serves as the treasurer/secretary for the East Central Dental Society. Dr. Vinson has received extensive training beyond general dentistry and is licensed by the State of North Carolina to perform oral conscious sedation. Outside of dentistry, Dr. Vinson is a husband and a father. He enjoys spending time fishing, playing and watching sports, and spending time with his family. He is a member of the First Presbyterian Church in Greenville, N.C., and is a volunteer for Give Kids a Smile. Beth graduated dental assisting school at Martin Community College in 2016. 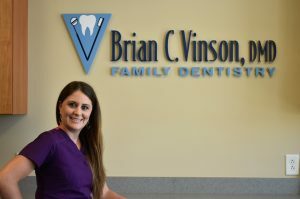 She began working for Dr. Vinson immediately following graduation. She loves working with the patients in the front office. During her free time she enjoys spending time with her husband and two boxers. She also enjoys shopping and spending time at the beach. Jennipher has been in the dental field for 13 years. She started as a dental assistant and then found her passion to be a hygienist. She graduated from Wayne Community College in 2011 and started working for Dr. Vinson following graduation. Jennipher loves to make lasting relationships with each of her patients. In her free time she enjoys spending time with her husband and two children, Brody and Colton. 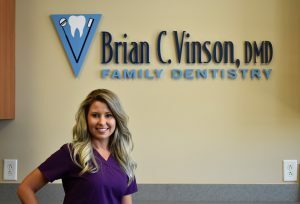 Brittany has worked for Dr. Vinson since 2013, when she was hired to fill in for Jennipher, who was on maternity leave at the time. Her personality was a perfect match for our office so we asked her to stay full time. She graduated from hygiene school at Wayne Community College in 2008. She is friendly and outgoing which always puts her patients at ease. Brittany loves to spend her free time with her two sons, Evan and Wyatt. 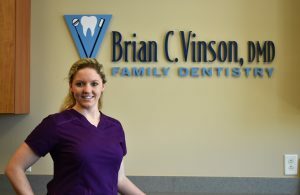 Orianna interned for Dr. Vinson while she was in the dental assisting program at Martin Community College. Her ability to make patients feel comfortable came naturally and she became a permanent member of the team in 2012 upon graduation. In her free time she enjoys being a member of the Choral Society in Washington and is also active in her church. She loves to spend time with her family and her dogs. Melissa has worked in the dental field for 11 years. She is originally from Vancouver, British Columbia, and graduated assisting school in 2006. 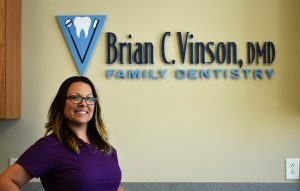 She began working for Dr. Vinson in 2015. Melissa enjoys being an assistant because of the variety of procedures she gets to assist. She is married and has one daughter, Evelyn. During her free time she enjoys spending time with her family outdoors.